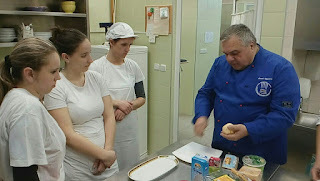 Students from "Slava Raškaj" Centar presented in school their experience during the culinary competition at Zadar. They gained new knowledge, made new friends and had a lot of fun. Special guests were chefs from culinary association "Renato" who trained students for competition. At the end of a presentation, the chef Matko Bukovec gave presents - the knives - to students, wishing them a lot of success in future cooking challenges. Special thanx to this association "Renato" whose chefs had selflessly and voluntarily given their knowledge, expertise and time to our students aiming to improve their cooking skills. And for believing in our students! !